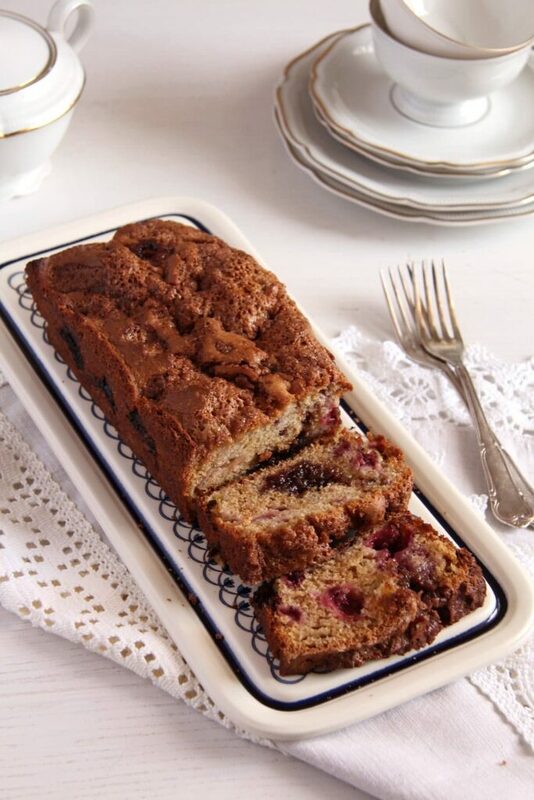 A treat for your coffee table: fluffy, sweet bread with rhubarb, blackberries and a touch of cinnamon. 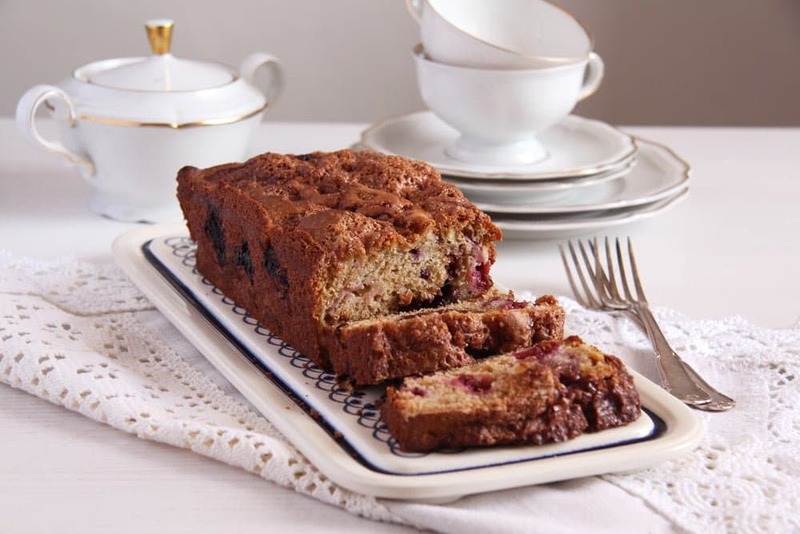 Deliciously moist and sweet bread with tangy rhubarb and blackberries, this is my Secret Recipe Club recipe for the month of April. I can assure you, you will looooove this bread/cake. I made it for my birthday breakfast, when I invited some of my closest female friends, we were 8 of us and each one loved this cake. Not to mention my kiddies, they ate lots the day I’ve made the cake and polished off all the rests the next day, complaining that the two loaves were actually not enough. 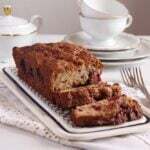 So I am pretty sure I will bake the Blackberry Rhubarb Bread with Cinnamon and Brown Sugar again this rhubarb season. The source of this wonderful recipe is Cook with Sara, a blog which I got to know through the Secret Recipe Club. 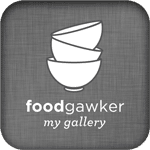 It is obviously run by Sara and she’s been adding recipes to her blog since 2009. You can imagine how much time one can spend on the blog, clicking through all these great recipes. As my theme for these two weeks is rhubarb, I searched for rhubarb recipes and I was impressed with how much choice there was. Thank God, Sara loves rhubarb just as much as I do, so I actually had difficulties not in finding rhubarb recipes but in deciding which one of these great recipe I would actually make for the assignment. In the end it was a tough decision between the Rhubarb Blackberry Bread and the Rhubarb Blueberry Bars and I made the bread because I thought it would be a better fit for the breakfast table. It did, it did, it did, it was the perfect finale for our breakfast. But I will make the bars as soon as possible as well, I love that thick blueberry-rhubarb layer one can see in the pictures. So make yourself a nice cup of coffee or tea and have a look at Sara’s recipes, you will definitely find something you will want to start cooking or baking immediately. Preheat the oven to 180 degrees Celsius/ 350 degrees Fahrenheit. Grease two loaf pans, about 23x12 cm/ 9x5 inch. Place the brown sugar, the oil and the egg in a large bowl and beat until blended. Add the buttermilk, the yogurt and the vanilla, blend again. Mix together the flour, baking soda and salt. Gradually add to the sugar mixture. Halve the blackberries if they are large and fold in the mixture together with the sliced rhubarb. Divide the mixture between the two loaf pans. Melt the butter in a small pan. Remove from the heat and stir in the cinnamon and the sugar. Sprinkle the clumps over the batter in the pans and bake for 50 minutes. Make the toothpick test, it should come out with only a few crumbs on it. Let cool in the pan for about 10 minutes, remove and let cool completely on a wire rack. Rhubarb grows like weeds in gardens around here, so we have to be creative about it, it’s a shame to waste it. You don’t need much for this recipe though, maybe you could give it a try. 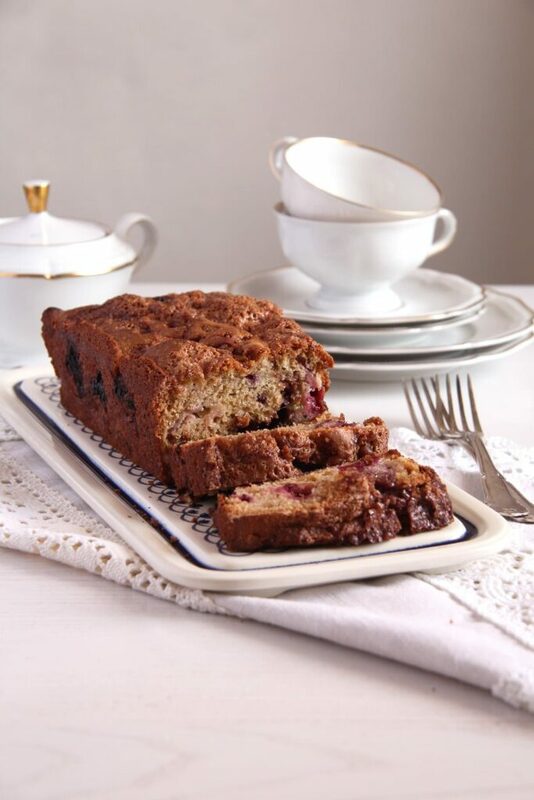 I am having my tea..now all I need just a thick slice of this beautiful quick bread! I wish I could send you one, Angie. Goodness, that looks SO good! I love anything with rhubarb during the spring. It’s so tart and perfect with most any kind of fruit. This bread looks wonderful and I know it wouldn’t last long in our house. Great SRC post! Thank you, Stephanie, I feel the same about rhubarb. You should try it in a savory combination as well, I think you would like it. I am so glad you liked it! Thanks for reminding me how good this is. I’ll have to get some rhubarb out of the freezer! Thank you for the recipe, Sara, I am sure I will make it again and again. You are picking some delicious things for the SRC, girlfriend! This bread looks fabulous! I love rhubarb, but have never paired it with blackberries – sounds delish! Cheers, girl! Thank you, Cheyanne. It was the first time of pairing it with blackberries for me too, it is normally strawberries, isn’t it? But it’s a winner combination. I’m not a huge fan of rhubarb but I bet I’d enjoy it in this bread. Great SRC recipe! Hi Adina 🙂 I had your blog for my #SRC assignment this month, and made your yummy Yogurt Dressing. I love it, and have been enjoying it a lot these last few weeks. I never was a fan of Rhubarb when I was younger, but since making a batch of Strawberry Rhubarb Jam last year, I’m definitely willing to try new recipes with it now. Your bread looks amazing, and I’m PINing it to try as soon as Rhubarb season starts in my area. I am glad you like the salad dressing and I hope you will try more rhubarb recipes, rhubarb is such a great veggie. Thank you, Jennifer, I liked the combination too. I want a piece of this now! It looks so good – just in time for rhubarb season! Yup, I’m glad I found the recipe, my kids just loved it so. This is a stunning bread Adina and blending rhubarb and blackberries is genius. I can’t wait to give this a try!! Perfect choice for SRC! Thank you, Jane, let me know if you like it. I love how sweet and fluffy this tea bread looks. The blackberry and rhubarb combination is perfect for the season too! This looks really fantastic! I like the combination of blackberries with the rhubarb. Nice SRC choice! Thank you, Amy, your chicken burgers look great as well. My son happened to see the pictures and immediately said he wants me to make that. This looks amazing! 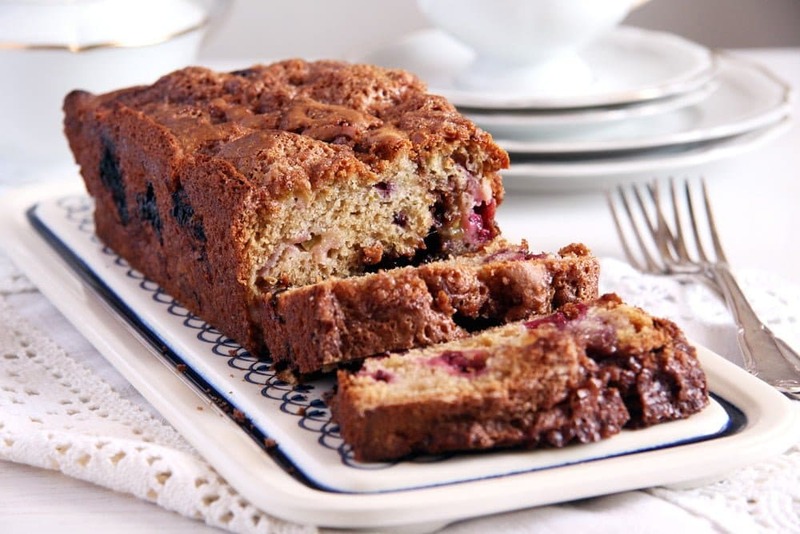 I love quick bread or muffins that are chock full of fruit.